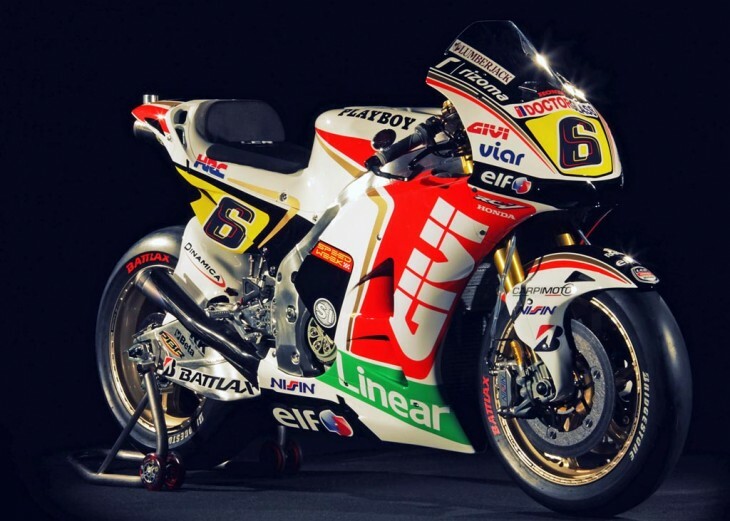 LCR Honda released specs (see below) for the 2012 Honda RC213v yesterday, claiming that Big Red has delivered more than 250 hp to satellite teams for 2012! By comparison, Ducati claims “only” 230+ horsepower from its new Moto GP bike. 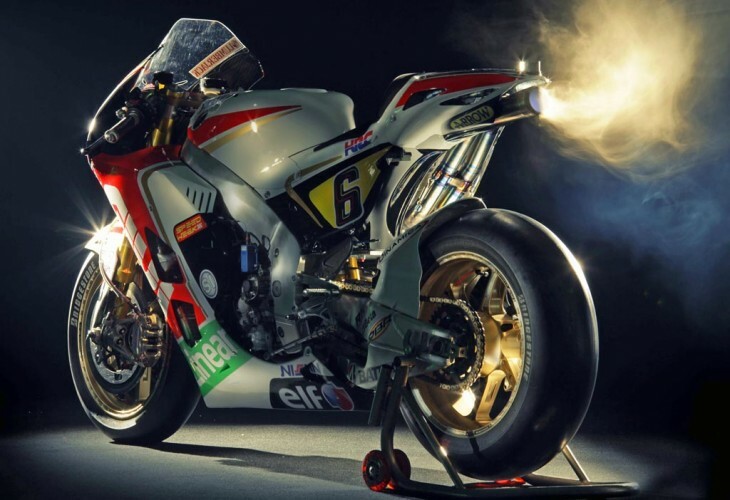 Interestingly, despite the relatively long stroke design of its new bike (dictated by the new rule limiting bore size), Honda has fitted pneumatic valves to its new race bike. RPM limits (red line) will be dramatically lower than last year given the displacement increase (from 800cc to 1,000cc) and the new bore/stroke configuration, but Honda saw benefit from pneumatic valves, nonetheless. 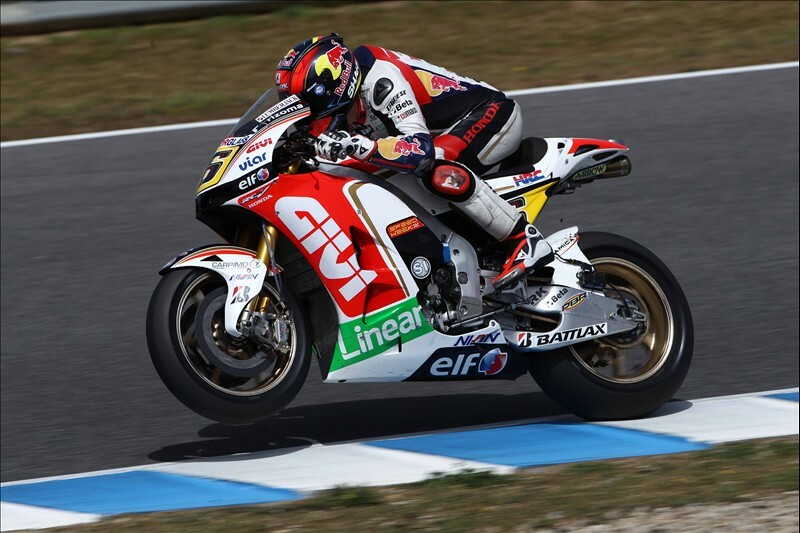 LCR’s Stefan Bradl rode this machine to the 10th quickest time (within 1/10 of a second of Valentino Rossi’s time on his new Ducati) on the opening day of the final MotoGP test at Jerez. We will give you the full rundown on the final test when it concludes this Sunday. Interestingly, LCR Honda has produced a superb “white book”, which you can see here. It is an elegant and interesting presentation of their racing team, sprinkled with quotes from Honda founder Soichiro Honda. Definitely worth taking a look. much bigger compared to 4-wheeled racing. of V-engines and I-3, as opposed to flat-plane I-4 etc..
more and more used as stressed parts of the “frame”, or what’s left of it..
Bottomline: the Inline-4 (at least when mounted in a conventional position in a bike’s frame) is VERY disadvantageous for the requirements of a top-level racing bike design. Just try to imagine how edgy it must be to control 250-ish HP at the rear tyre under extreme lean angles, and you’ll anticipate how every single aspect of the way HOW is the power delivered suddenly becomes extremely important. In all fairness, Ducati just says “over 230hp” in their press thingy, which means they likely are making about the same HP too. Yeah. Maybe that’s why the best rider in the world (Rossi) keeps cracking the top 5. Not. Are you the Ducati rep? Remember, those are peak numbers. They say nothing of what’s down below or how it’s delivered. It will be interesting to see how much of this new, increased horsepower actually makes it to the track, in a racing situation. Aren’t these bikes still limited to 21 liters of fuel per race? A modern day equivalent of the Mobil Economy Run. With one or two additional liters of fuel there might be a real challenge to the electronics engineers. Imagine having 250 hp available for every situation where you could use it. Very good point. Plus, aren’t the CRT bikes also allowed more fuel? As for the hp number, it’s astronomical but I think the 990’s were close to that before. We don’t know what the 800’s did but the fastest trap speeds ever recorded were on 800’s so it has to be really high. Dayum..345 pounds and 250+ horsepower..can you imagine? That’s the ugliest GP bike ever. Hope Yamaha/Lorenzo win the championship. It does look bulky. Even the wheels looks small. Is that the tallest profile rear tire you’ve ever seen? We already know that this platform is devastatingly fast. “Fastest lap ever recorded on a motorcycle” at Sepang. GP bikes are the definition of “Purpose Built”. When AMA racers (used to riding modified street bikes) take their first ride on a GP bike, they can’t believe how different it feels, handles, brakes, etc… GP bikes are built to go fast on tracks. Period. I don’t know how Ben Spies rides his. He is just over 6 feet tall (I think) but the GP bikes are as small or smaller than 600cc street bikes! Small bikes make a smaller hole in the air, so they go faster. Tall tires make a larger contact patch when leaned over at full tilt, and allows more lateral grip for turning, braking and accelerating. Wind tunnel testing dictates the body style, and how the rider has to fold themselves up (chin hard on the tank) to maximize speed. That makes them look a bit odd compared to street bikes made to be “practical” by allowing passengers, absorbing larger speedbumps and potholes, etc. Its beauty is in its functionality. It’s nice to see that Honda R&D can still rub the magic lamp, when they decide to. It would be nice to see some more of this brainpower focused on their streetbike offerings. They are the world’s largest engine manufacturer for a reason! They know engines and must have felt with the “limitations” imposed upon engine bore size this year that it was time to go with pneumatic valve actuation. I’d be interested when Honda’s engine is opened up so we can see what they have done. pretty sure dirck means to say “retained” pneumatic valves. honda resorted to nitrogen firing (or should i say closing) in ’08 after both them and yamaha were collectively handed their asses by ducati. and not that bologna did anything special, desmodromics simply make for a superior “air pump” with better V/E numbers as displacement drops. Aren’t they actually electrically actuated? not yet. as far as i know formula 1 still uses pressurized nitrogen (from which the bike systems are derived). the actuation is only used to put the valve back on the seat. a conventional cam is still used to lift the valves off their seats. i reckon it’s pretty bullet proof at this point and performs well ahead of what’s needed. unlike F1, RPM’s here can’t be converted into downforce. One thing about Honda/HRC; their bikes (even satellite ones) always look the most well finished. Almost production worthy. The welds, the carbon weaving, even the cables. I wonder if all the Hondas are using Nissin brakes this year, or just LCR. Too bad all this trick technology gets castrated by having GP bikes run at car circuits . They should make the Isle of Man part of the GP calendar again… or better still, the Ulster GP …. also bring back the old Assen and make em visit Phillip Island 4 times a year!! by car circuits, you mean the same ones that were purpose built to accomodate the scale of F1…? Yes. Slow corners… long straights… slow corners. I now live in Singapore and have ridden track days in Sepang, Malaysia in the past. Great in a car (fastest I’ve gone is in a friend’s cousin’s 911 GT3), but on a bike it just doesn’t flow. Yes, I realize I’m no racer, but even Rossi calls Sepang and most other GP circuits car tracks. when I want a special ride, I ride my 2006 RC51 SP2(Texas Tornado’s favorite racebike), for everyday ride I ride my CBR600F4I. Been waiting for Honda to make V twin or V four sportbike again, like the 2012 CBR1000RR and been thinking to buy one for months, but it’s an inline four. Wishing for a 2013 RC213V. Honda does still have the VFR, now in a 1200cc iteration. I believe their new Cross-tourer uses the same engine. Are either sport bikes? No, but the VFR’s do a pretty good job. The venerable VFR800 may also still be available, although it’s also a bit of a porker. The average street rider for some reason wants inline fours. It’s also much cheaper to build an inline than a V configuration. A V also has smaller profile from the front, so, theoretically less drag. I think it’s more that inline engines are what the factories want to make (for the reason you state) than what the consumer wants. If any of the japanese brand’s top performance sport bike were a V-engine at the same price as the other inlines, customers would want it. Today the configuration is the domain of ~$18-20k Italian and Austrian bikes. Inlines are cheaper, plentiful and hit the numbers. That’s why consumers like them. Simply put “people” by the bikes the magazines push. Seems like the PR folks like to push the Horsepower numbers, and riders love that. But most mature riders understand that torque is where it’s at. V-motors pull out of corners like no ones business. A typical street rider will never ride their in-line four at 10 or 12,000 rpm where they make power. Instead they lumber them through corners at 6 or 7,000 rpm. They should be on a V-motor! Hmmm…, KTM RC8R (1190cc V-Motor) = 127 NM of torque @ 8000 RPM : Suzuki GSX1300R (1298cc in-line four) = 140 NM of torque @ 7000 RPM. unfortunately, you’re making the classic mistake of simply comparing apples to oranges. no worries, what you need is a common metric to tie those 2 models together and give it meaning. it’s starts with asking the question, “gee, how much does a busa weigh?”. i already know the numbers and the answer, but just spiting ’em out (like most are apt to do) doesn’t really help. so what i’d like, is for YOU to complete the rest of the math and then come on back and report on what you’ve discovered. how’s that sound…? Stupid — the topic is engine design (or, as the OP put it: ‘motors’) not motorcycles. By the example I cited, “mature” riders would choose the in-line four (not the v-motor, preferred by the OP) — the in-line four makes more torque and at a lower RPM. I’m with John and Todd — power characteristics are designed-in — not a consequence-of. except in practice this isn’t what occurs. mature riders (by definition) are neither math AVERSE nor are they inclined to just “write off” the effects of gravity. then what we have here is a “hat-trick” of bad assumptions…! 🙂 LOL guys, designing it in is just ONE way, not to be confused with the ONLY way. This common perception about V-engines likely came about because certain engines that happen to be V configurations also employ other design factors that genuinely do have the effect of shifting the torque curve to lower rpm. Engine torque (in the sense of the actual value that is measured at a given instant) is linearly bound with the quantity of work the engine performs per rotation or per intake stroke (or per any increment of rotation, as opposed to an increment of time). Owing to the equivalence between work and energy, it follows that engine torque abides by a universal proportionality with the quantity of fuel consumed per individual intake stroke (the proportionality is different for different fuels, and it also depends on combustion efficiency and on the engine’s thermodynamic efficiency). To increase engine torque by 10% (at some given rpm), it is absolutely necessary to increase the quantity of fuel consumed per intake stroke by 10% (at that rpm). The question thus becomes why the cylinder configuration would directly influence the quantity of air+fuel taken in by the engine per individual intake stroke. The cylinder configuration does not influence this quantity of fuel in any direct manner, and because it does not, it also does not have a direct influence on the overall shape of the torque and power curves. In pointing this out, I have attempted to be tactful and show no disrespect to other people. I sincere hope that I have not offended anyone. then you need to keep thinking is all. the answer’s there. here’s a hint, it’s not nearly as complicated as you’re making it. that’s what’s keeping you from seeing it… “you’re overshootin’ the runway”. I side with Mr Tuttle on this one. You can engineer any characteristic you want into an engine. Being an inline or V is immaterial. The original comment related more to the basic perception of everyman and the colloquial use of the term Torque to mean low end power, vs. high rev peak power. excellent, then this will be a “3-fer”. re: “You can engineer any characteristic you want into an engine. Being an inline or V is immaterial”. you (and you only) are right in this observation, statement, but what do you have when you fail to split hairs on the engineering…? what do you have as a bonus, when you’ve spec’d a configuration for an unrelated set of priorities…? ps, there are hundereds of thousands (if not millions) of engines in operation that got spec’d on only a handful of parameters. a current example that comes to mind would be mazda’s outgoing 2.2L diesel. RTL’s statement is 100% correct. I can’t wait for there to be an aftermarket pipe that adds 5 more horsepower. Imagine how cool it will be with 255! Right? Maybe add a 12oclock bar and a stunt cage? Why do the race bikes keep going back to the V4 and the street bike’s stay with the inline ? shorter crank shaft with less flex, narrower with less wind resistance, lighter, more efficient. Also the effect Yamaha went after with their cross-plane crank. The V engines are much smoother because when a piston is stopped at the top or bottom of the stroke, there is an opposing piston is moving at max speed mid-stroke. Life is too short to ride cheap bikes, and this bike will make life even shorter. Comment made me laugh. Think I’m gonna have to steal it. Hope you don’t mind.